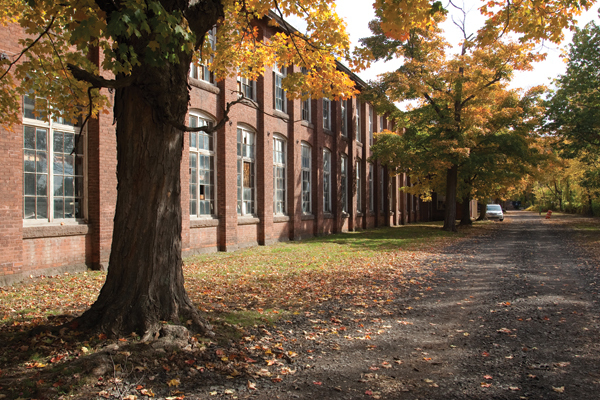 MIDDLETOWN, CONNECTICUT—From bicycle wheels to automobiles to typewriters and electronics, the sprawling Remington Rand complex in Middletown has held an important place in the state’s economic history since 1897. But over the decades, the hub for heavy industry took a toll on the environment, contaminating the surrounding soil and groundwater and polluting the Mattabessett River. Although the Remington Rand division closed the factory in the early 1970s, the facility still carries the familiar name. The property was foreclosed in 1999 and taken over by the City of Middletown. Today, it’s undergoing a substantial, city-led cleanup and renovation effort, designed to help attract emerging businesses and create jobs. 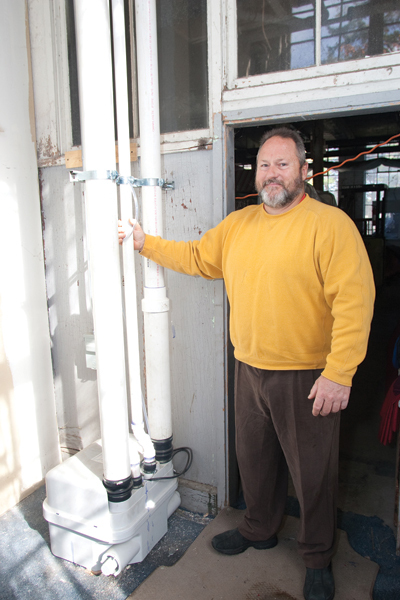 Bringing the facility’s outdated plumbing into the 21st century is the effort’s centerpiece. “The building was a disaster when the city took it over,” says William Warner, Director of Planning, Conservation and Development for the City of Middletown. The area, all but abandoned, had become a host for illegal activity, and was filled with junked cars and other debris. There was also a serious pollution problem. 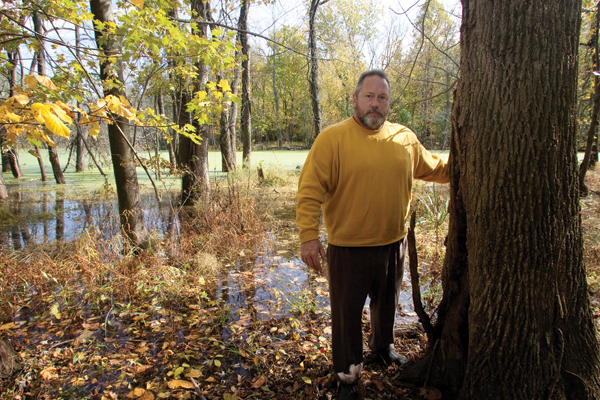 “The property was never tied into the Middletown sanitary sewer system,” Warner explains. “When it was built in 1890, the plumbing was designed to flow into the nearby river. So we took it over and began the cleanup.” To solve the building’s plumbing problem a septic system seemed the way to go initially, says Warner. 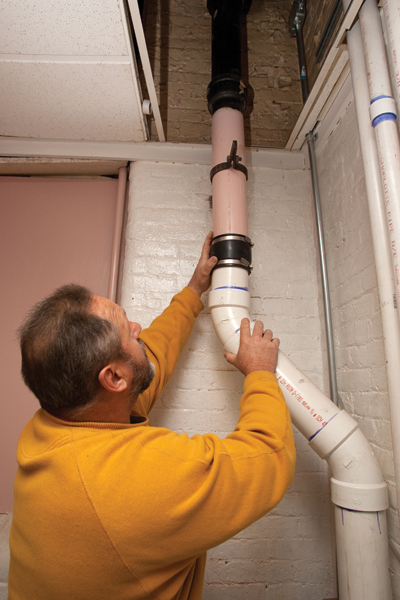 But sewer lines 15 to 20 feet in the ground and groundwater in the old clay pipes eliminated that option. It was a challenge. Plumbers couldn’t dig in the ground, and they would have to bring the sewer main to the end of the building where the manhole and tie-in are. 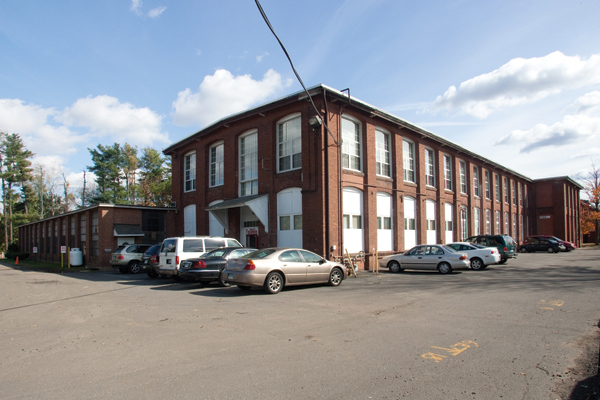 Plus, the Remington Rand building is 950 feet long – more than three football fields ¬– so bidders had to present a solution for moving plumbing waste across this expanse plus another 100 feet or so beyond its walls to the sewer main. That made the problem tougher. “If you applied the normal plumbing pitch that has to go in pipes,” Warner explains, “you would have more than 20 feet of drop” across the building. But the first floor is only 12 feet high. 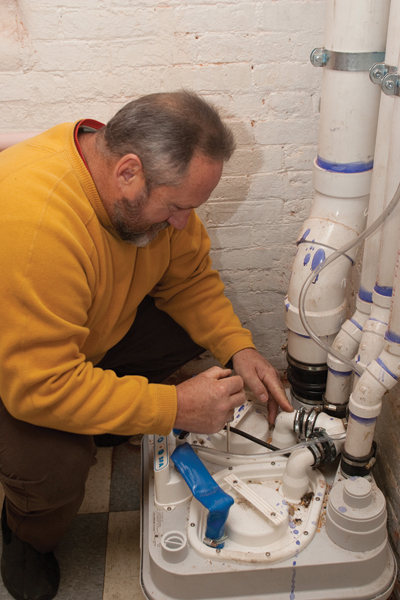 Enter Al Warren, a licensed plumbing contractor for more than 30 years and owner of Warren Brothers Mechanical Contractors in Stafford Springs. He won the contract based on a design that uses a series of Sanicubic duplex grinder pumps, made by SFA Saniflo Inc. The result was the installation of five duplex grinders, positioned at intervals on the ground floor, along the length of the building. This created a “stair effect” that achieved the right pitch in the pipe to accommodate the extreme length of the sewer line. The duplex grinders are installed right on the floor – there is no need to dig. 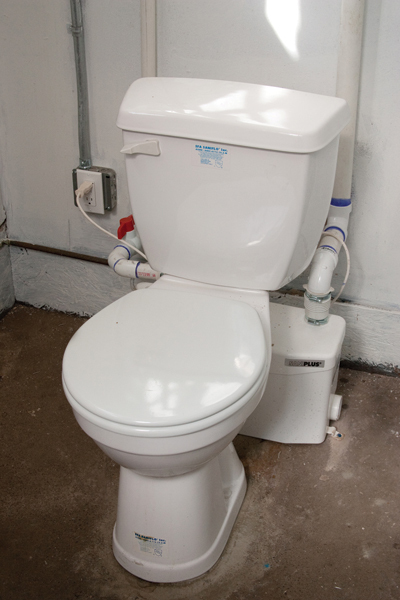 They can handle waste matter from multiple plumbing fixtures, without storing sewage, as sewage ejectors do. 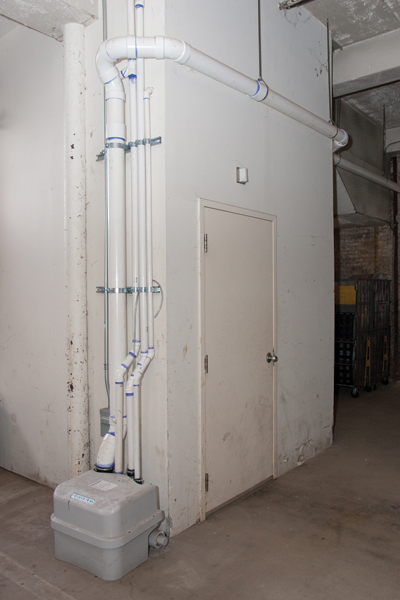 Each one pumps effluent up through small diameter pipe into the main and out to the sewer. 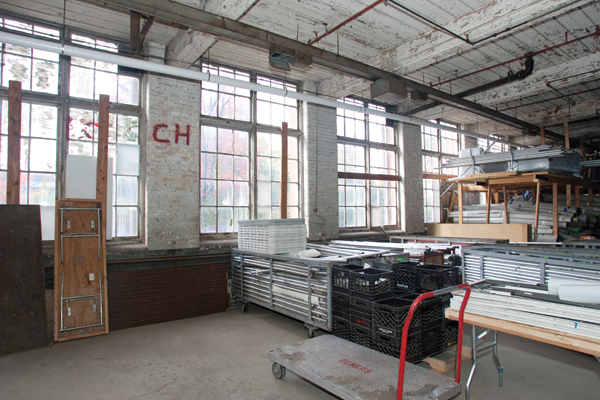 They work in concert, handling cumulative waste for the entire two-story building. 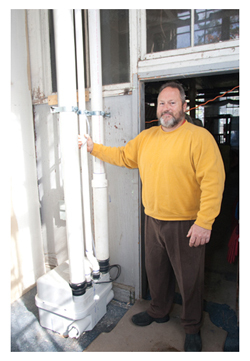 While the Remington Rand building may be unique, Warren says duplex grinders are a good option for any application and a great alternative to septic systems and sewage ejectors. 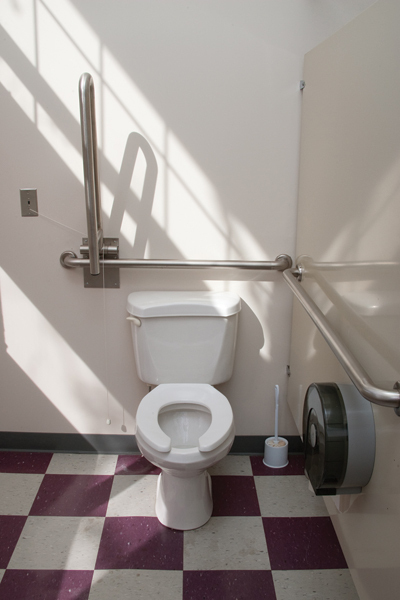 The Sanicubic can handle waste from toilets, tubs and showers, sinks, washing machines and dishwashers. And, he says, expanding use of the facility can help to create jobs – something that is welcome in Middletown and in any community today. 1800X1200 px; CMYK; unless otherwise specified. Pictured is installer Al Warren, licensed plumber and owner of Warren Brothers Mechanical Contractors in Stafford Springs, Conn. Warren’s design for a series of Sanicubic Duplex Grinders was selected to upgrade the plumbing at the 110-year-old Remington Rand building in Middletown, Conn. The white, 4-inch main, catching effluent from Sanicubic Nos. 1 and 2, can be seen suspended near the windows. The installation involves a total of five Sanicubic Classic duplex grinder pumps. Sanicubic No. 3 is installed further down the factory outside this restroom and approximately 500 feet from the first duplex grinder. This is a longer view from the point where the discharge from Sanicubic No. 3 enters the main. Seven DFUs flow into Sanicubic No. 4, pictured here. This effluent is combined with discharge from the first three grinders for a total of 49 DFUs. This is the final grinder, Sanicubic No. 5, with 4 DFUs that are pumped up to join the cumulative flow from the other four Sanicubic units. A total of 53 DFUs are pumped another 275 horizontal feet out of the building and to the sewer. 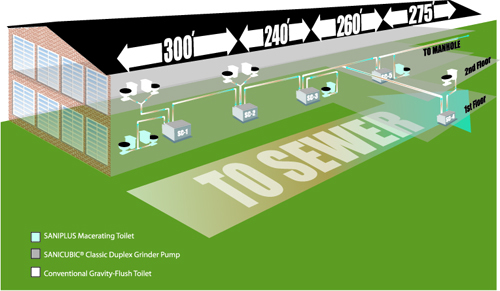 All of the ground floor toilets are Saniplus macerating units, also made by Saniflo. These upflush units can be installed directly on top of the floor. 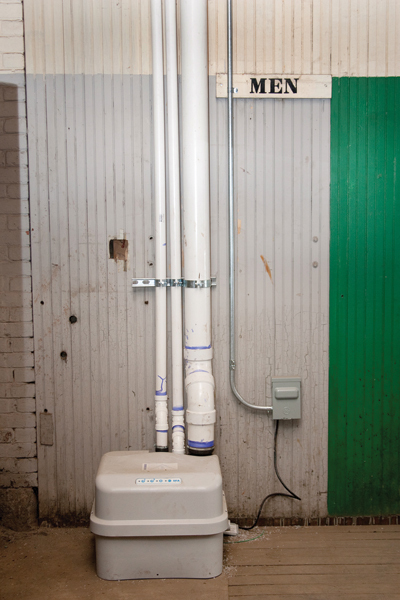 Plumbing from this second floor restroom flows into the second duplex grinder, which ultimately handles 38 DFUs. 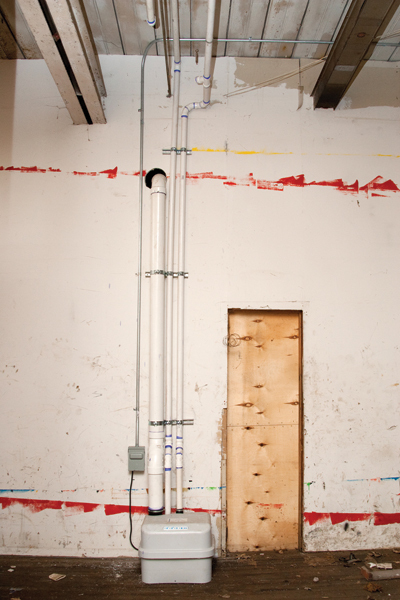 A ceiling panel has been removed to reveal the discharge line, which contains the effluent from the second-floor restrooms, flowing down into Sanicubic 1. 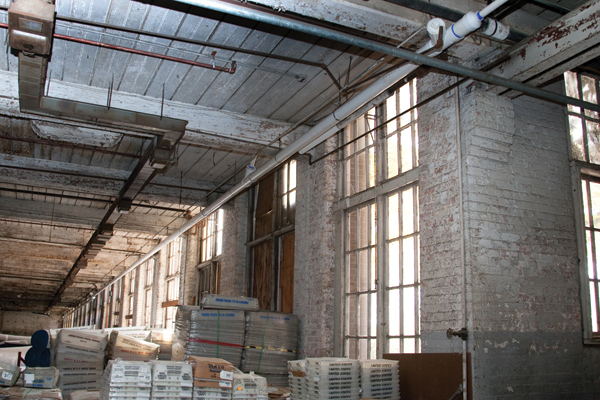 The Remington Rand building is nearly 1,000 feet long. The Mattabessett River is beyond the rear of the building. This is a swampy area on the Remington Rand property. Groundwater was found in the old clay pipes and contamination was found everywhere. Digging to install sewer and plumbing lines wasn’t an option. The Sanicubic No. 1, the first of five in the system, is installed at the front of the Remington Rand building, pictured here. 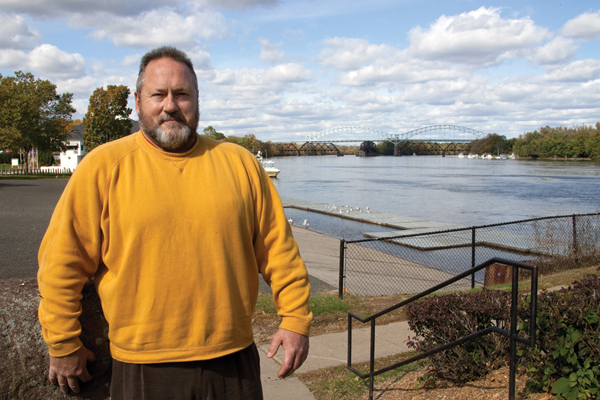 Installer Al Warren is seen looking at the nearby Mattabessett River.